Here are details of a local 5k multi terrain race taking place at the University of Essex on Saturday 2nd March starting at 11am. 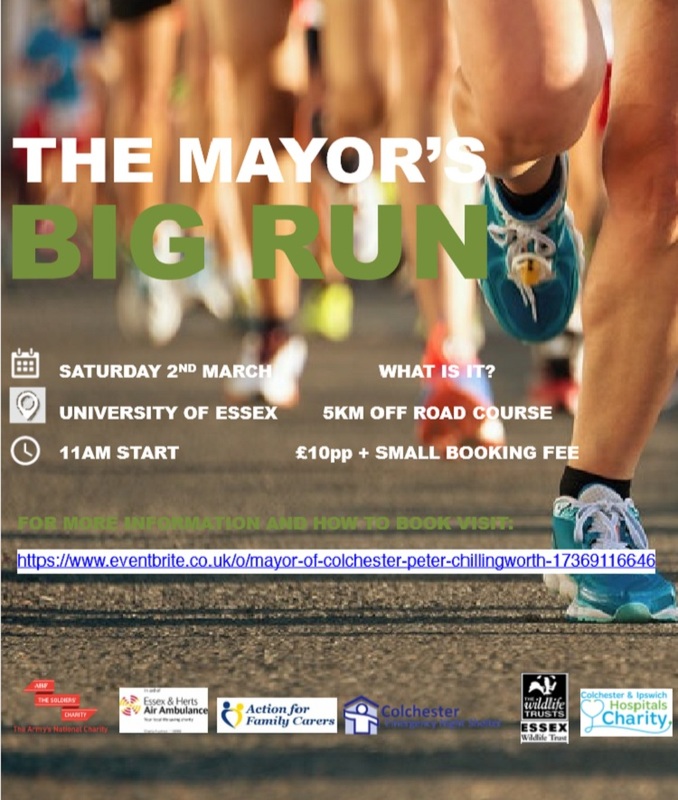 Peter Chillingworth, Mayor of Colchester invites you to take part in a 5 km run at the Essex University Colchester campus at 11.00 am on Saturday 2nd March. All proceeds will go to the six Mayor’s charities shown above. The Mayor would like to thank the University and staff for their cooperation in organising the event. He is also very grateful for their support to Birkett Long, solicitors, Nicolas Percival estate agents and Colchester Trophies for their generous support. The course is on University land and comprises grassland, woodland and hard paths and is not suitable for spikes. For safety reasons, no headphones please. Electronic chip timing organised by Nice Work will provide all finishers with an accurate time. Six trophies will be awarded to the first three men and first three women; all finishers will receive medals. Entry is open for anyone 15 or over. Children between 12 and 14 may run if accompanied by an adult runner. When collecting your number, please state your likely finishing time to ensure an appropriate place at the start. It is hoped that the event will prove popular so for organisational reasons, early entry via the link below is essential, with entries closing at midnight on 23 February. No entries on the day; the run will be limited to the first 1000 entries, including the University Students Union allocation of 100 runners. Numbers to be collected from the pavilion, so please arrive in good time. If travelling by road, please arrive via Colchester Road, Wivenhoe and right into Boundary Road. Parking will be close to the University playing pitch pavilion and start/finish. Please follow signs and marshals directions.